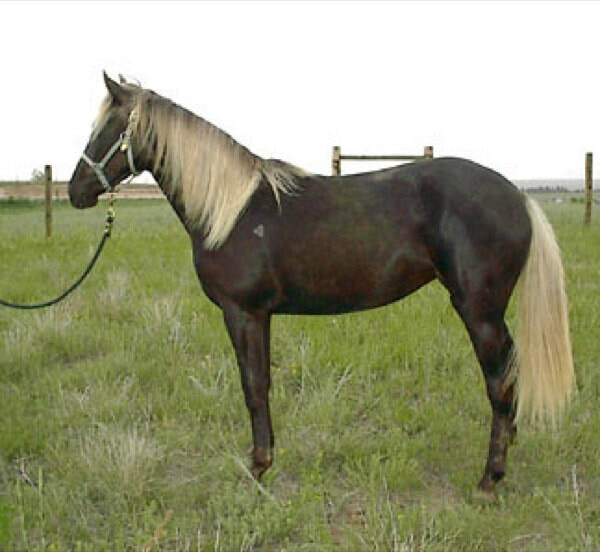 Chocolate horses have a dark body color with a flaxen or white mane and tail. However, the flaxen color can be spotty and often fades with age, so occasionally this characteristic is not as pronounced as you might think. Chocolate horses are also called Silver Dapple or Taffy. 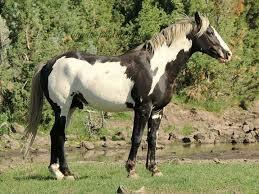 Genetics: The Silver Dapple Gene works to dilute the black pigment in a horse's hair. It dilutes the body color slightly and the mane and tail significantly. A chestnut horse may cary the Chocolate gene without any outward change in its appearance. Because this gene only changes black pigment and has no effect on red pigment, red horses are often not effected by this gene at all. 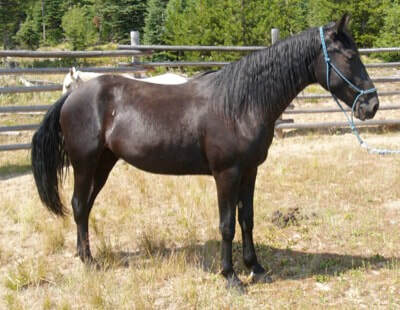 A black horse which carries the Chocolate gene results in the typical brown body color with flaxen to white mane and tail. In this case, the Silver Dapple Gene dilutes the black pigment in a horse's body hairs by lightening them slightly, and dilutes the black pigment in the horse's mane and tail by lightening them significantly. 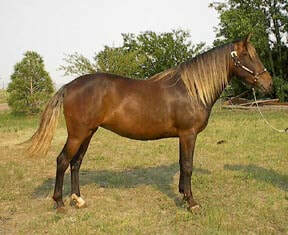 A bay horse which carries the Chocolate gene results in a Red Chocolate. 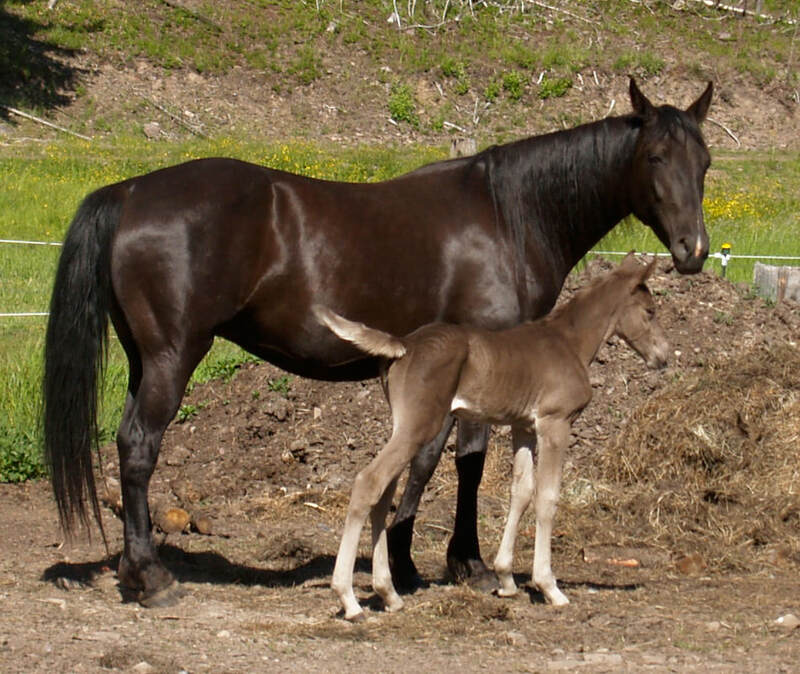 In a Red Chocolate, the Silver Dapple Gene dilutes the black hairs of the body slightly and the black hairs of the mane and tail significantly, just as with a black horse. However, because a bay horse has more red mixed into its hairs, this dilution is often not as obvious as it can be in horses with only black hairs. 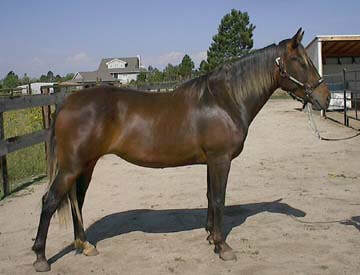 Description: Chocolate horses have brown body colors with manes and tails which are some mix of brown and flaxen. Many Chocolate horses have dapples visible when their hair is short or the sun is bright. The variations possible within this color vast. 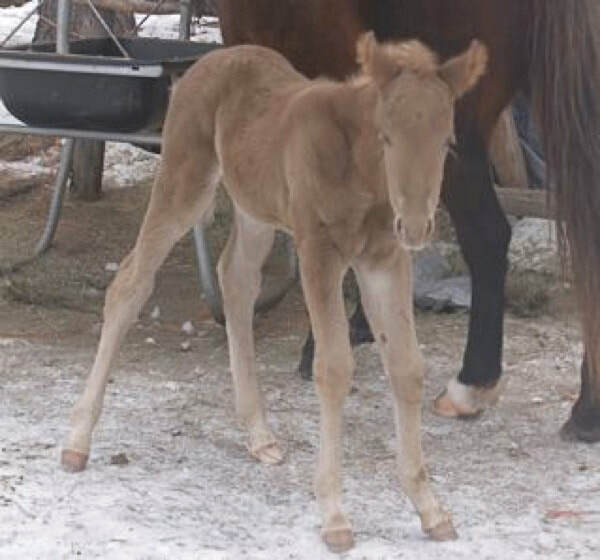 This Chocolate filly has a light brown body with a very flaxen mane and tail. This is a classic chocolate colored horse. 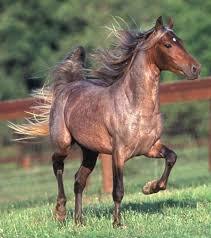 As Chocolate horses get older, they often get more brown or red mixed in with the flaxen in their manes and tails. Chocolate horses are not born looking chocolate at all. They are often born a silver-gray (thus, the name "Silver" dapple) with light legs, but can be other dilute colors as well. Paint - ​The paint gene can be imposed over silver dapple the same as any other coloring. 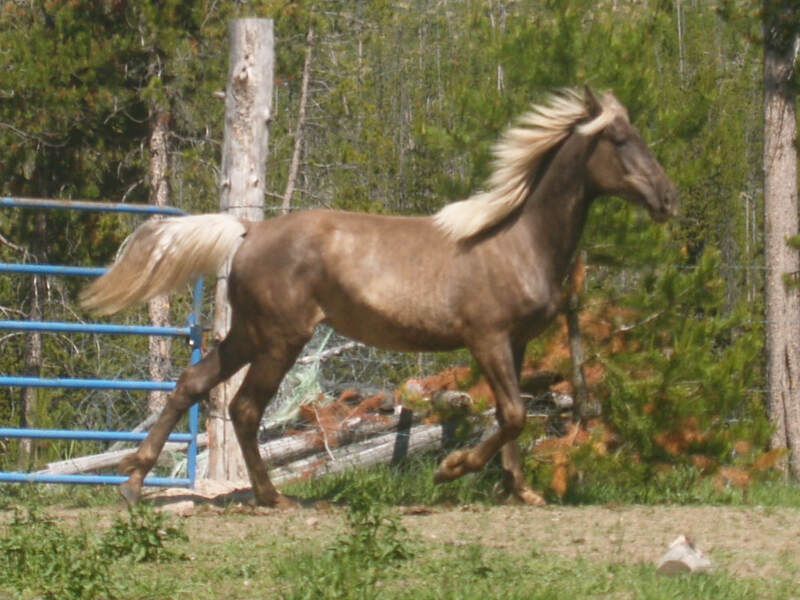 Roan - The roan gene can be imposed over silver dapple the same as any other coloring. 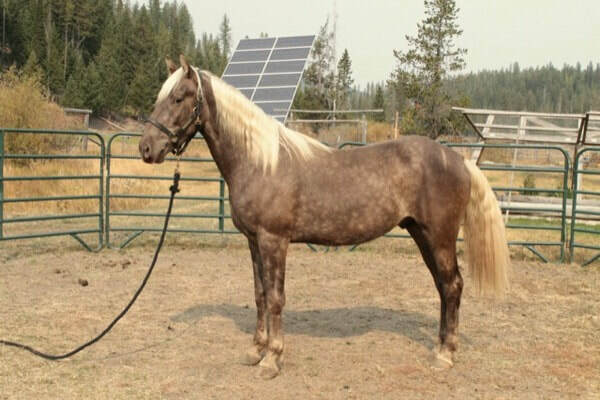 This is Classic's Shogun, a roan silver dapple bay RMH. 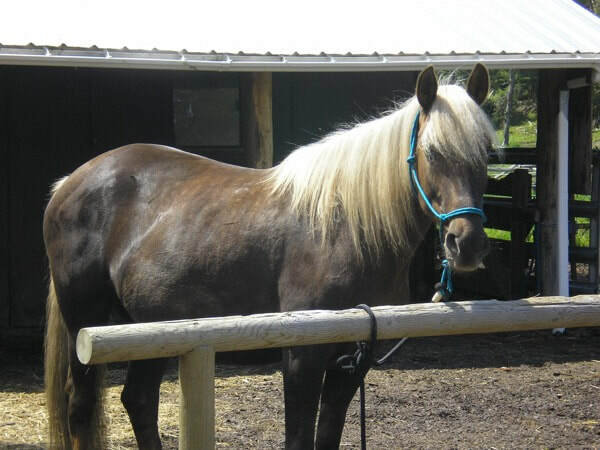 He is also owned by Volz's Mountain Horses. There are few other colors which are easily mistaken for classic Chocolate, but Red Chocolate can be mistaken for quite a few other colors. Bay - A red chocolate can sometimes be mistaken for a bay horse, if the lightening of the mane and tail is not obvious and if the body color has a lot of red influence in it. 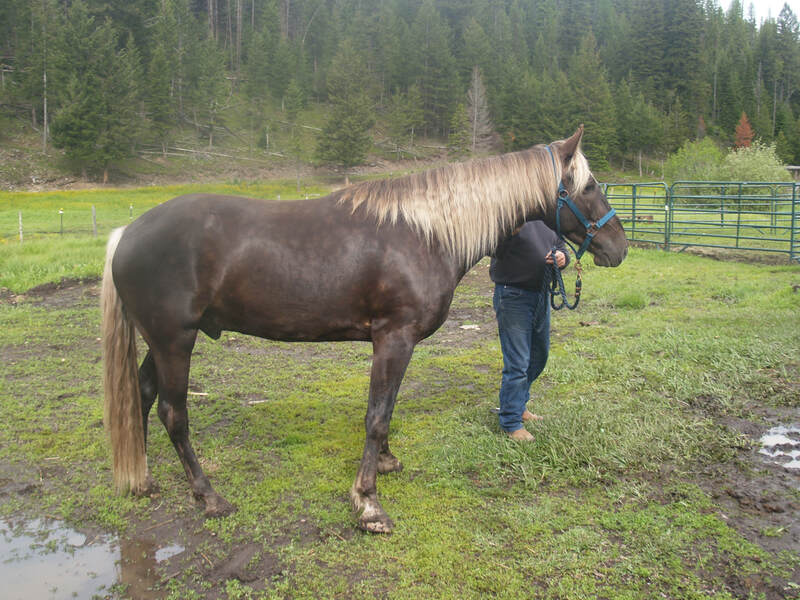 As is common in Chocolate horses, this Red Chocolate mare's mane and tail darkened as she got older so that she was easily mistaken for a bay. Red - A red chocolate can sometimes be mistaken for a red horse, if the body color has a lot of red influence in it. Additionally, a chestnut horse can carry the chocolate gene without showing any outward signs of it. This Red Chocolate horse has enough flaxen in her tail to almost be mistaken for a Chestnut or Sorrel horse. Palomino - It is possible for a chocolate to be so light or a palomino to be so dark that each can be mistaken for the other. 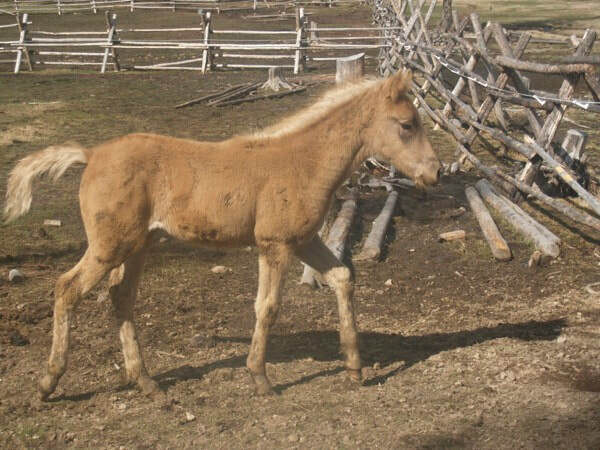 This Palomino horse started out a dark gold in color, but every time she had a baby her body color permanently darkened until she was eventually darker than some of our chocolate horses. Perlino or Cremello - A Perlino or Cremello may have a Chocolate gene and not show any visible signs of this. This is because the double cream gene responsible for these colors wipes out all of the horse's color, leaving it impossible to tell if another gene is present which would have diluted what color was there. 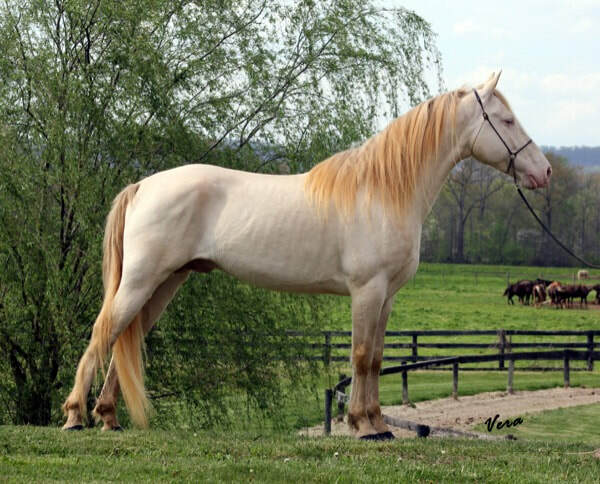 This Perlino stallion has a Chocolate Gene which is completely masked by his double dilute cream gene. He has a 50% chance of producing Chocolate foals.